I’ll again try to keep this year's review on the briefer side; for plenty of background info, please see the previous years' reports, accessible below (suggestion: you may wish to read - or skim - them in chronological order, starting with 2010, or at least read the 2010 installment for background). 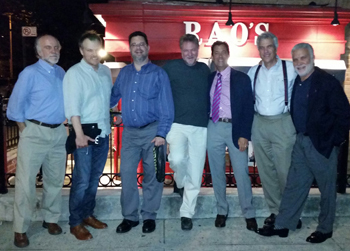 Last night was the seventh incarnation of what our generous host Fred calls “Boys’ Night Out” at Rao's. If you are unfamiliar with the legend and lore of Rao's, the venerable (founded in 1896 – not a typo) little East Harlem venue that likely is the most difficult restaurant ticket in the country, do see my previous reviews for background info. The L.I. contingent gathered at our secret meeting spot and I drove us up to 114th St. and Pleasant Ave., in East Harlem. 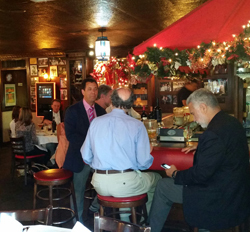 Seven “BNO” regulars gradually arrived and gathered at Rao’s bar: Fred, Lonny, John, Odey, and 3 Davids. The first celebrity we noticed was Tommy Mottola, in a black T-shirt and black baseball cap. To refresh your 1980s/1990s recollection, he was the head of Sony Music Entertainment for a decade and a half, and was married for a while to Mariah Carey. At another table, there was a world-ranked tennis player. And there probably were other notables to whom we didn’t pay attention, in the packed room. We were seated at a table in full proximal view of the framed photo of Fred on the restaurant wall. Coincidence? I think not. Lonny brought a selection of awesome red wines: a Kosta Browne Pinot Noir 2010; Ridge Monte Bello 2000 (red meritage blend); Ornellaia 1999 SuperTuscan; and two bottles of Ramey Diamond Mountain 2002 (red meritage blend), just because. There was the usual selection of breads (with olive oil, of course) on the table. Head waiter Joey sat with us to recite the menu – everything is shared, family-style, so we ordered by consensus. And then the food started to arrive: first a simple but delicious salad with what else but the house Italian dressing, excellent baked clams, and (overly?) vinegary seafood salad. Next up was the pasta course: elemental Fileto di Pomodoro with pancetta and rigatoni, classic large meatballs, and good linguini with white clam sauce. Main courses were: pork & peppers, broccoli rabe, shrimp parmigiana, chicken scarpariello – all delectable. And I can’t forget the dozen scoops of excellent ice cream, for dessert, accompanied by espresso and after dinner liquors. I hope, both as a business mediator and generally for the sake of gustatory humanity, that they resolve things amicably. If they need some assistance, I’d be happy to exchange my mediation services for a few of their ethereal meatballs. Hoping, as always, that there’s more to come, next August. Many thanks to Fred for hosting this merry band of “boys” for 7 years in a row. This year, Paul Napolitano was a welcome addition to the group (Fred, Paul, Lonny, John, Odey, Tony and three Davids). The excellent wines he brought were an added perquisite. Four of us drove this evening in the drizzle up to Rao's in East Harlem, where we met the city contingent (and one Rhode Islander). We decided to forego the customary drinks at the bar because Paul and Lonny each brought 4 bottles of great wine - Brunello, Barolo, you name it - and instead immediately migrated to our table (the large one up front, which fit the 9 of us comfortably). I've described the repast and atmosphere in some detail in the prior years' commentaries; suffice it to say that Rao's has lost nothing and maintained everything, year after year. So, the request has been placed. And next spring, we'll await that annual email, a few months in advance, advising us that we again will get to enjoy Boys' Night Out at Rao's, in the coming August. One can hope. We’d thought that last August’s bacchanal and food fest at famed Rao’s at 114th St. and Pleasant Ave. in East Harlem (reputedly the toughest restaurant ticket in the country) would be our last, hence my report last year was entitled “The Postscript.” Minor miracles do occur, and here we were, last night, back again in the historic home of great Neopolitan (southern) Italian food. With the proviso that “what happens at Rao’s, stays at Rao’s,” I report here on (some of) what transpired last evening at what has become a time-honored tradition for Fred and his band of merry men (none of whom wore tights, I’m happy to report). I drove three of us into the city from L.I., and met up with the other five participants at Rao’s bar, before dinner. Those of us who hadn’t seen each other in a while got to catch up, and Fred got to start kibitzing (umm…commenting) with everyone. And inevitably, the photo-taking began. See three attached examples. The place is a bit kitschy, old-fashioned, down-to-earth, and unique. That was such a pleasure. Thanks for including me in one of the most fun nights I've had in a long, long time. I don't know how you guys are on email so early - I'm still in bed sleeping it off. Great wine, great table, great stories. Best dinner in New York that night, I'm sure of it. Lonny brought several bottles of excellent Italian and Napa wine from his collection, and I strategically brought a bottle of Fernet Branca, a digestif (FB is a unique after-dinner libation -- look it up! ), to aid the revelers in dealing with the inevitable excess. Lonny's wines were, in the order they were opened, a magnum (1.5 liters – double-sized bottle) of Merus 2000, a cult Napa Valley California Cabernet (blended with a bit of Merlot and Petit-Verdot), a bottle of Lupicaia 2000 (a Super Tuscan blend of Cabernet Sauvignon, Merlot, and Petit-Verdot), and one of Marchesi Antinori Solaia 1999 (a classic Super Tuscan blend of Cabernet Sauvignon, Cabernet Franc, and Sangiovese). The food. All courses are served “family style.” Maitre D’ Joey recites the menu, and we all chime in to reach accord on what to order for each course. News flash: Fred, our host, is not shy. First course: Salad (simple but excellent), seafood salad (one of my perennial favorites here), baked clams (always good), softshell crabs (my first time having them here, and they were delicious). Second (pasta) course: Filetto de Pomodoro penne (elemental and al dente), meatballs (unique, and possibly the best I’ve had, consistently each year), orchiette with broccoli rabe and sausage (delicious). Main course: Steak (eh – not my favorite here – the weakest dish of the bunch, in my opinion), chicken (quite good – tender and tasty, even though I’m not usually a fan of lemon chicken), escarole (‘atsa nice), shrimp parmigiana (another favorite here). Dessert: A platter of selected flavors of black cherry, chocolate, coffee, and vanilla ice creams (homemade and stupendous), as well as espresso, the Fernet Branca, and complimentary Anisette (we wisely decided to forego the cheesecake and other offerings at this point). If you add eating great food, and mixing it with conviviality, friendship, atmosphere, and banter, that general concept just about sums up the Rao’s experience. The three Long Island participants take turns driving, so last evening, I drove the L.I. contingent in from our secret meeting place behind Kitchen Kabaret in East Hills, off Glen Cove Road, near the L.I.E. (whoops, I guess I revealed the secret; that’s the only time I’ll blab in this review, I promise). We arrived early, around 6:15, and hung out on the corner outside Rao’s, chatting for about 20 minutes, before repairing to the bar to commence libations. Fred and the others followed soon after. The seven of us (one of last year’s eight couldn’t make it) moved from the bar to the table around 7:15, to begin the repast. The celebrants of Boys’ Night Out were Fred, Lonnie, John, Odey, and three Daves (two lawyers and a doctor – a Jewish mother’s dream from the 70s; nowadays she’d likely prefer a plumber, an electrician, and a techie from the Geek Squad). It's a little different each time at Rao’s, due to small shifts in the attendees, the food and drink ordered, the atmosphere and mood. Fred said he wanted to “slow things down, make it last longer,” like a vacation that ends too soon. While ordering the appetizers, he mused that before we know it, we'll be finishing dessert. For an optimist, he’s quite a pessimist. Odey came up with a new idea – he purchased three Powerball tickets: one QuickPick, one “good guys” ticket and one “bad guys” ticket. We had to guess the significance of the numbers in the two latter categories – it turns out that they were the uniform numbers of “good guy” baseball players (like Mantle, if you ignore his penchant for over-imbibing) and “bad guy” baseball players (like A-Rod). The best part? Odey promised that if any of the three tickets is a winner, the seven of us will share equally the $425 million (or other) winnings. The obligation was witnessed by the entire table, and now is memorialized in writing, so Odey’s on the hook for a big number, if we win tonight’s drawing. Fred hedged his bet by also buying his own Lotto tix for his family. Speaking of baseball, Odey also was the first one to spot fellow Rao’s patron Bobby Valentine (the popular former NY Mets manager) at the table next to us. While we’re stargazing, I’ll note that across the dimly-lit room, we also saw Charlie Rose, or a pretty good imposter. And there was the aging Mafioso whose name shall not be mentioned and whose photograph shall not be taken. And a young woman whose tattoo “sleeve” caught Fred’s attention (he mentioned it at least seven times, I think, and not necessarily in complimentary fashion; more like, WTF?). And at the table on the other side of ours, there were four (dare I say aging?) women, to whom Fred explained “Boys’ Night Out” and analogized their event to ours (nice try, Fred). And if my wife reads this, yes dear, they were much, much, much older than you and your friends. Ribald humor was, as usual, part of the order of the evening. I could tell you some of the jokes and the conversation, but then I’d have to kill you. Or my wife might snuff me while I sleep. Or Joanne might “off” Fred. This is why what happens at Rao’s on Boys’ Night Out, stays at Rao’s. Fred, you can thank me later. Always the consummate host, as soon as we ordered, Fred was concerned that we might not have ordered enough food. As if that were possible. Yes, we shared only two bottles of wine this time (which made the drive home safe and easy). Yes, we did order less food than previous times – no, Fred, that doesn’t make us dainty women; rather, it makes us a bit more conscious, in several respects. Everything is family-style, so you can decide how much or little to glom onto your plate. I left feeling very satisfied, but not in pain, like the first time. So I think we did indeed “slow it down.” We ordered the following, and it all was very good: Appetizers: seafood salad (always excellent), fresh mozzarella (out-of-this-world silky and delicious) and tomato, baked clams (top-notch). Pasta course: sausage-orchiette-broccoli rabe-garlic (a favorite! ), penne filetto (that’s a nice-a), ethereal meatballs. Main course: veal (tender) and steak (the latter was much better than in previous years, when candidly it’d been the low point of the meal). Dessert: tartufo and chocolate, amazing raspberry, vanilla ice creams. Double espressos. And the house always buys our table an after-dinner Frangelico, Limoncello, Sambuca, or other drink. I’d brought along a bottle of Fernet Branca for after the meal. If you don’t know what it is, Google it (it’s an unusual 90 proof digestive aid that some say has magical properties, a favorite among bartenders, and definitely is an acquired taste, unless you enjoy medicinal herbal booze). I felt compelled to share and turn on the assemblage to this controversial beverage, and I even distributed a brief fact-sheet about it (so shoot me, I’m a lawyer). BTW, Lonnie actually already was a fan of Fernet Branca – I think one would be hard-pressed to introduce Lonnie to anything he doesn’t already know about! Rao’s generally doesn't accept checks....so guess how Fred paid? Lonnie drove Fred home; during the ride, Fred called Dr. Dave every few minutes (mostly intentionally, but several times by “pocket-dialing” him). I couldn’t hear Dave’s speakerphone well, but it sounded like Fred either was feigning or genuinely concerned that Lonnie was taking him to parts unknown (perhaps to imbibe further) rather than home (as Fred’s bedtime was approaching). If I never get to go to Rao’s again, I’ve had four great, but each time slightly different, experiences. If I do get to go again, I’ll try to make my review a bit shorter. Fred calls it “Boys’ Night Out.” To see how in the past I’ve described this annual August fun feast, and for background on the legend and lore of this famous NY establishment (e.g., the elemental food, how impossible it is to get a dinner reservation and not only because of their very limited hours, who shot someone at the bar, and what happened to Madonna there), please see the two previous pieces I’ve written, at Fred’s request (insistence? demand? ): 'Boys night out' at Rao's (Aug. 2010) and Boys’ Night Out at Rao’s, Part Deux (at least for me)(Aug. 2011). So, now onward to “Boys’ Night Out” at Rao’s – the Final Chapter (once again, mandated by Fred – not a bad quid pro quo, in my view…). There were 8 of us once again, and Fred, ever the consummate host, had secured for us the largest table in the small house, by the front doors, which were opened to the beautiful dusk weather. We consisted of a plurality of Davids, the one and only Fred, John, Lonnie, Odey, and Tony. We had a newbie waiter, because Joey, the regular one (see the 2010 piece for a description) was away. Most of the dishes ordered (family style) were the same as or similar to those of previous years, with a few new substitutions: Garden tomato fusilli, breaded veal, and steak in a sauce of tomatoes, mushrooms, and onions – all 3 new dishes were very good, however, the latter only because it was saved by its sauce (at least I’m consistent – I’d previously admonished a steak dish for being slightly sub-par on this extremely high-par course). Two quotes from Fred that sum up the evening: “I am so happy to be in the bosom of my friends.” And: “Tonight’s was the best group yet.” (He specifically wanted to be quoted, because…he’s Fred.) It must have been good, because we ended later than in previous years – nearly 10:30 p.m.
And Dr. Dave opined that it’s not only the quality of the food, but perhaps even more the unique atmosphere of the place, exuding a special kind of kinetic energy born of people truly enjoying themselves, that creates the special experience that is Rao’s. This is the “Final Chapter” because, as I understand it, our host is losing the table rights that flowed in some fashion from his recently-relinquished position of Treasurer of the Friars Club. I’m sad that we won’t get to do this again, but I’m very, very glad and appreciative that I was able to participate these three years. It’s a peak experience for those who get to go, whether once, thrice, or regularly. And my daughter still has the Rao’s T-shirt that Lonnie had given me (as he does for all newbie guests) and that I bestowed upon her a couple of years ago (she looks much better in it than I would). I’ll try to make this year’s summary of the annual festivities at the venerable and unique Rao’s restaurant a bit more concise than last year’s review, but it’s difficult, when the experience is so inspiring. For all the interesting background information (including how difficult it is to gain access to a table there, who shot someone at the bar, what happened to Madonna there, what kind of love Fred experienced after our meal in August 2010, and other items reflecting Rao’s uniqueness), please check out my post from last August, below. And now, for the sequel, let’s fast-forward to the evening of August 9, 2011. This year, we had 8 celebrants, hosted by Freddy “The Blackberry” Kleintino (last year’s moniker will have to stick): Fred, Lonny, Dave, Vinay, Brian, Odey, Dennis, and me. The drive into Manhattan in torrential rain did not daunt the culinary ardor of the three of us (two Daves and an Odey – hey, that could be the name of a short-lived sitcom) trekking in from Long Island. The nabe: 114th St. and Pleasant Ave. Plenty of New Yorkers don’t know that the restaurant’s in East Harlem. It is. And not at all un-pleasant. Lots of character. And characters. The equipment left over from a weekend street fair took up nearly all the parking spaces on one side of Pleasant Ave., so Rao’s patrons double parked all along the block. No cars were ticketed, no one was asked to move. A nice side-benefit of being a Rao’s customer. The gathering at the bar: Yes, this incidentally lubricates the conversation, but I suspect that the food and atmosphere would do quite sufficiently even absent the liquid entertainment. After priming the pump, we proceeded to Fred’s table (this time it was the large 10-top up front to commence the evening’s gustatory debauchery. The food: See last year’s description. It’s consistent. And that’s a good thing. OK; I’ll dish on the dishes: There’s no written menu. Instead, Joey, our waiter, pulls up a chair and makes suggestions, all of them delectable. Collectively, the 8 of us ordered the following to share: Appetizers – seafood salad (wow), mussels (excellent), roasted red peppers (nice), baked clams (very good). Pastas -- Penne arrabiata (perfectly spicy), orchiette with sausage and broccoli rabe in garlic and oil (elemental), and four of the house’s famous oversized wonderful meatballs to share. Main – Veal with hot cherry peppers (just as great as last year), shrimp parmigiana (the best I ever have had – exquisite), steak pizziaola (not so exquisite). Fred vetoed the soft shelled crabs, claiming allergy. Dessert – three or four flavors of the deservedly famous homemade ice cream, a slice of cheesecake (decent), espresso, and a complimentary after dinner drink (Frangelico, Limoncello, Sambuca, etc.). We stayed OT at our table, well past 9:30, till nearly 10 p.m., theoretically risking our lives, as the denizens of the adjacent (2 feet away) bar eyed our seats and located our carotid arteries. time, presumably much to the chagrin of…Fred. The host: Fred is indefatigable. Consummate. Gracious. Welcoming. Generous. An accomplished raconteur. Have I sucked up sufficiently to enhance my chances of being reinvited next year? I could go on…and if I must, I will. I apologize in advance for the length of this posting, but I think relative comprehensiveness helps to afford this topic the treatment it warrants – this special evening deserves full description to convey its full flavor. Tomorrow, perhaps we’ll deal with world peace. But for last night, well, it was a very, very good night for seven fortunate fellows: Fred (our host), Odey, Ben, Dave, Peter, Lonny, and me. How did I come to be involved in this exclusive evening? I’m not completely certain, but I do know one thing for sure: It was at least in part because I never asked. For the past couple of decades, I’ve wanted to go to Rao’s (pronounced Ray-O’s). Not just because of its special brand of exclusivity, not just for its renowned Neapolitan (Southern) Italian cuisine, and not just for bragging rights, but rather for the whole experience. That’s what we got last night at the corner of 114th Street and Pleasant Ave. in East Harlem, where Rao’s has ruled the corner and the neighborhood since 1896. Rao’s is one of the most difficult restaurant reservations to secure in the country. There are only ten tables, ranging from 4 to ten seats (although the ten-top near the front door stretched to accommodate a dozen last night). They’re open only weeknights (yes, closed weekends). They serve only dinner (apparently some tables turnover once for a second seating, and some have only one seating). Loyalists from the previous century have been given standing reservations, making them akin to owners of their table for a particular night of the week. These rights are bequeathed in wills. They’re fought over by progeny, and doled out to coveting friends (or temporarily given back to the “house”) sparingly on an occasional basis. Madonna famously was refused a table when she walked in without a reservation. You wanna get in? Fuggedaboudit. The stories abound. If you need to know more, you can read about Rao’s online (for example, in Wikipedia, in online reviews, or in a colorful New York magazine story – findable through Google or Bing -- about the time years ago when Louie “Lump Lump” Barone shot and killed another patron at Rao’s bar). I drove three of us into town from Long Island. One of my passengers, who’d been to Rao’s with Fred a number of times, regaled us with some of the lore and legend, food highlights, and other interesting details about this place to which we’d gain entry, courtesy of our host, Freddy (the “BlackBerry”) Kleintino. Our group of seven included four Rao’s newbies (myself included), Fred, and two experienced guests. The ages of the participants at our table ranged from 31 through…ummm…Fred. Fred had monikers for some at the table: his best friend, favorite client, greatest constructive critic (yours truly, in the latter role). Fred was ubiquitous, adeptly orchestrating (he’s the Mahler, Mozart, or Mussorgsky of hospitality) to ensure all enjoyed the varied conversation, the atmosphere, the food and drink, the energy, the entire experience. Fred was the consummate host. Somewhat shockingly, Fred’s constant companion, his BB handheld device, appeared only a couple of times during the evening. We checked his vital signs, however, and they remained good. Moving from the bar to our table against the back wall of the smallish room, Fred told some stories (that I imagine he’s probably told many times to many different assemblages of guests) about the background of his connections to Rao’s through co-owner Ronnie Straci, involving their respective fathers as well as an amusing incident in a case early in Fred’s legal career. I’ll leave the details for Fred to tell when he wants to and as only he can. I’d be remiss if I didn’t mention the framed photos completely covering the walls of the joint, including at least one prominently featuring our own Gotham Networking co-founder who is not Nancy. Although Fred does not “own” a table, he is able to schedule his reservations for the year all at once. Rao’s is a tougher ticket than Le Bernardin, Per Se, Masa, or Jean Georges – much harder to get in. Fred definitely is “somebody” at Rao’s, notwithstanding his protest to the contrary to that criminal defense lawyer. OK; I suspect if you’ve read this far, you’ll want to know about the food. But first, the surroundings. A few steps down from sidewalk level, as mentioned. Old-style appearance, like a movie set for a film depicting such a NY restaurant in the middle of the last century, or perhaps earlier than that. Sorta quirky Christmas décor year-round. The aforementioned framed photos. High spirits, fueled by alcohol, espresso, and camaraderie, prevail. The waitstaff is welcoming and well-practiced at kibbitzing and engaging in mock-arguments with mock-belligerent patrons like Fred. And now, the food: In a word, peerless. OK, another word: wow. Not the most elegant and refined, but definitely the best in its rustic category. No fancy sauces (unless you count the superb red sauce as fancy), no flourishing presentations, just darned great Southern Italian family-style cooking that’d make your Neapolitan grandma green with envy. Three types of bread at the table (each one better than its counterpart anywhere else), along with garlic-laced olive oil for dipping, and parmesan cheese and dried red peppers for sprinkling. They neither need nor use any menus; rather, our order-taking waiter, Joey, pulls up a chair, places it backwards, and sits at your table while he recites a litany of deliciousness that utterly melted any resolve to refrain from sheer gluttony. Please don’t tell my doctor. We collectively selected the various appetizers and main courses to share, family style. As best I can recall, we had: elemental seafood salad in a light vinaigrette, beautifully spiced penne arrabiata, perfect baked clams, super-fresh mozzarella and tomato, ethereal meatballs, salty and garlicky orchiette with broccoli rabe and olive oil, flavored roasted potatoes (this for me was the only dish I’d preferred elsewhere), exquisite shrimp parmagiana, celestial veal chop sliced off the bone with hot cherry peppers (my law school chum Jay will be happy to learn that I agree with his recommendation), and flavorful chicken scarpariello with sausage and peppers. One bottle of Chianti Classico replaced another repeatedly throughout the evening, which was not a bad thing. If I’ve omitted anything, I apologize, but my brain still is besotted with the excess. And then came time for dessert. The waiter apologized for the temporary dearth of ice cream flavor selections, but the black cherry ice cream was so good that we didn’t miss the lack of variety. Tartufo and cheesecake rounded out the sweet selections, accompanied by espresso, both decaf and regular. Then Jessica, our waitress, came by to offer Frangelica, port, limoncello, or other after-dinner drinks. The finale, the “cherry on top” for the evening, was that when we walked outside and up the few steps, there was an impromptu doo-wop quintet of a capella singers, including co-owner Frank “Frankie No” Pellegrino, right outside the front door, singing their hearts out, just like on similar NY street corners back in the ‘50s and ‘60s – a real slice of old-time New York. And inevitably, Fred jumped in to participate in a rendition of “Sunday Kind of Love” – Frankie, who also is a professional actor, singer, and entertainer, actually smiled at Fred in approval of Fred’s bass lines. I couldn’t really hear them from where I stood, so I’m absolved from fulfilling my apparent role as constructive critic, in this connection. Maybe that’s my critique – Fred should project more. Who’d ever think anyone would say that? Anyway, I’m happy that he got to have the “Dion and the Belmonts” moment of his life, and that I was there to witness it. I now have had the rare opportunity to enjoy the experience of Rao’s. It really is indeed all it’s cracked up to be. How often does something live up to the hype this well? I’m obviously honored to have been there last evening. And courtesy of Fred’s “favorite client,” I now have the T-shirt to prove it. … well, Rao’s, of course. 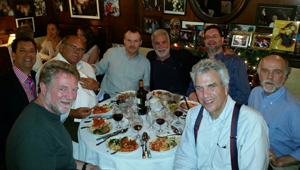 Last evening, I had the pleasure of being invited by our esteemed leader to dinner at Rao’s with Donald “Hard Hitting” Bernstein and Joe ‘Spider’ Sciabica. And, yes, there is a picture of Fred and his family on the wall. After a quick drink at the bar, we were quickly whisked to Norman Spizz’s table where we settled in for the evening. Everything you’ve heard about Rao’s is probably true. It is fairly small, has a very comfortable feel (though Norm’s booth could have been a little more spacious), and has great food; a good time was had by all. And like everywhere you go with Fred, he knows everybody, and all the staff knows Fred, and while they might not be wearing white jackets like in other restaurants (or bars), the service is fantastic. There is no menu. Joey (now nicknamed “The Joey”) comes by to tell you what they are serving that evening, gives you suggestions so that you don’t order too much, and takes your order. Seriously, he has the nicest penmanship from any one in any restaurant that I’ve ever seen! Victoria Drogin did such a wonderful job of describing the fare in her posting last month that I won’t try to out do her…but her description was right on target. The fresh seafood salad is one of the best I’ve ever had; the pastas were delicious; great steak and fish; and amazing homemade black raspberry ice cream and tartufo. A delicious dinner! Of course, the best part of the evening is spending time with fellow Gothamites. It seemed we were laughing from the moment we sat down until the time we walked out the door. And a night isn’t complete without a story…this one being how Fred met co-owner Ron Straci, both young attorneys facing off in an important case. It turns out their fathers were best friends…but neither of them knew it until them met in the courtroom! Small world…. And it wouldn’t be a night at Rao’s without a celebrity sighting, would it? Sitting at a table next to us (with his dachshund below his chair) was Ben Gazzara. And interesting aside, my wife, Leslie, was recently at a party at which Ben Gazzara attended with is dachshund! Clearly he is in the right place at the right time…or we were. Thanks, Fred, for a great evening!